Are power rankings completely dumb and meaningless? Yes. Yes, they are. However, personally speaking, whenever I see them, I click. And now that I've sucked you in with promises of many power rankings, you'll read it and like it. Top wish list item: To defy the odds. A loss to the Cowboys on Sunday dropped the Eagles' chances of making the playoffs to 8 percent. With back-to-back games at the Rams and home against the Texans coming up, it's not looking very promising. One more loss and the Eagles will become just the 11th defending Super Bowl champ to finish with a non-winning record the following season. #JimmySays: Top wish list item: Officiating competence. To say the late-touchdown-nullifying OPI on Dallas Goedert was a bad call would be like saying Hugh Douglas and Terrell Owens disagreed slightly. And it was only compounded by a terrible roughing-the-passer call on Randy Gregory on the following play, though Eagles fans were probably satisfied with that ruling. Man, what a crappy sequence. What all the ticky-tack judgement at the end of Eagles-Cowboys obscured was a wonderful football game, another in a long line of exemplary NFC East title bouts between Philadelphia and Dallas. In three of the last four years now, Eagles at Cowboys has gone into overtime. Sunday did not disappoint, even if Doug Pederson's group left town dejected. Say this for his football team: Philly left it all out on that field at JerryWorld. Michael Bennett, Fletcher Cox and Brandon Graham played their butts off. As did Darren Sproles. What a game. Remember also that the season is far from done. With the Panthers, Bucs, Redskins and Vikings all losing, 8-8 might be enough to earn that sixth seed in the NFC. No, seriously. #JimmySays: Uh, what about the fumble? The Super Bowl hangover looks to be complete. The loss to Dallas all but ends their chances to repeat. #JimmySays: Their chances of repeating aren't good because they're not a good football team this year, but the loss to Dallas certainly doesn't come close to ending their season from a mathematical standpoint. They're a half-game back in the wildcard. Take literally 15 seconds to google "NFL Standings" before you write something like that. Geez. Super Bowl hangover is real. Philly about to become fourth defending champ in past seven years to miss playoffs in subsequent campaign. It was a little surprising that Doug Pederson, whose calling card last season was being aggressive, didn’t go for a two-point conversion after the Eagles scored with 1:45 left. He kicked the extra point and played for overtime. It wouldn’t have been a bad call to go for the win there, given that the Eagles were underdogs on the road. 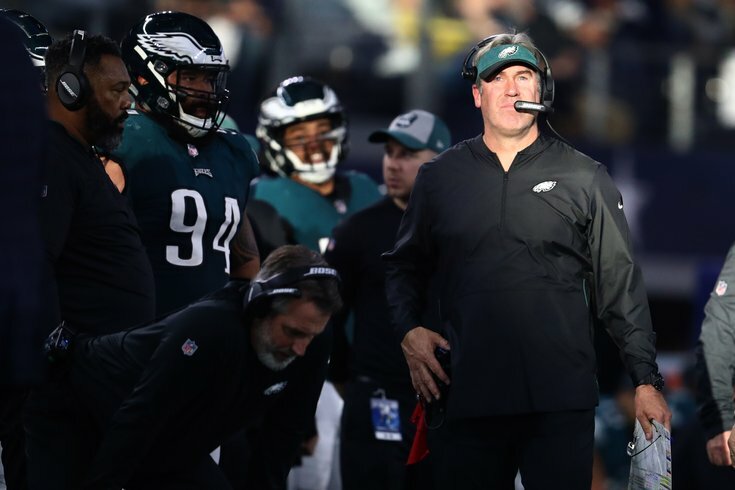 “I felt at the time that we were still going to win that football game,” Pederson explained, via WIP 94. “And our defense was gaining momentum, we were beginning to put pressure on Dak [Prescott], and doing some things that way.” Instead, the Eagles tied the game, lost in overtime, and their season is on life support. The Eagles’ equal defensive problems against run and pass keep dragging them down, and the Rams are about to deliver the final nail. What a difference from last December when these two teams played. #JimmySays: I thought the Eagles were reasonably good against the run on Sunday, especially seeing as they were missing their MLB, and their top two other linebackers were playing with one hand a piece.